Nicola Woodham makes non-verbal sounds and uses audio devices to distort her voice in her performances. The non-human-verbal is a way for her to project a sense of voices to come or in a process of becoming. She is based in London, UK and holds an MFA Fine Art degree from Goldsmiths College. In Sound Acts, she presented "Garg", a piece that draws from her own resistance of being monitored: as a female performing body, as a woman making loud noises in public, as a citizen. "The heart chilling groan of the Gorgon, whose name is derived from a Sanskrit word garğ meaning a guttural animal howl that issues as a great wind from the back of the throat through a hugely distended mouth" (Anne Carson). 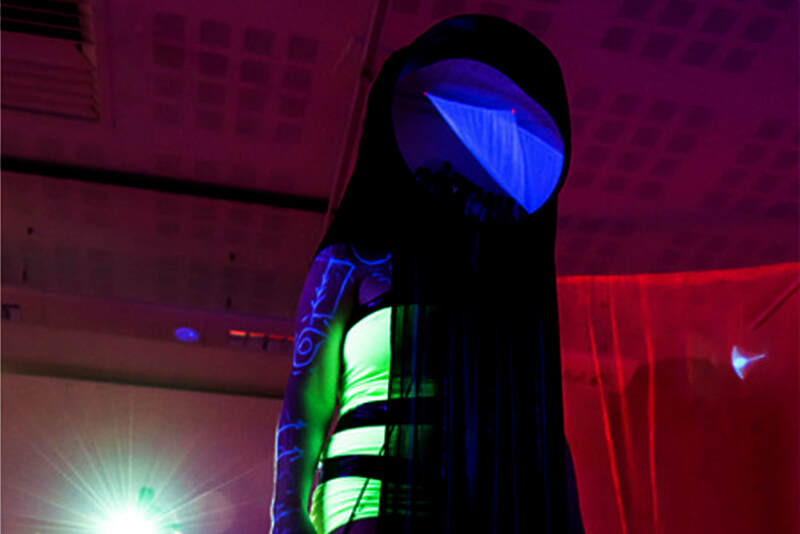 Working with UV-light-painted circuits on her body as well as live midi controllers, the aim is to temporarily create a fantastical world that reveals the becoming of a non human entity.